Major Crimes debuts tonight on TNT at 10:06 p.m., right after the series finale of The Closer. This will probably seem self-explanatory, but much of how you feel about Major Crimes will depend on how you felt about The Closer, the just-concluding series that wraps up its run right before the new spinoff debuts. The two shows share much more than DNA. They share a substantial amount of their supporting cast, a creator, and a more character-centric approach to procedural TV crime fighting. I was never a huge fan of The Closer, but this was more to a general inability to get on board with Kyra Sedgwick’s wildly over-the-top work as Brenda Johnson, which I found often distracting and too broad for the show’s attempts at semi-realism. Despite that, I largely liked the idea of what The Closer was going for. By delving more into Brenda and her colleagues’ home lives and personal situations, the series was a throwback to ‘80s cop dramas like Cagney And Lacey, and that was at least a little different from everything other cop drama on the air. Major Crimes is being described as a spinoff, and while it’s that, it’s a very specific kind of spinoff. 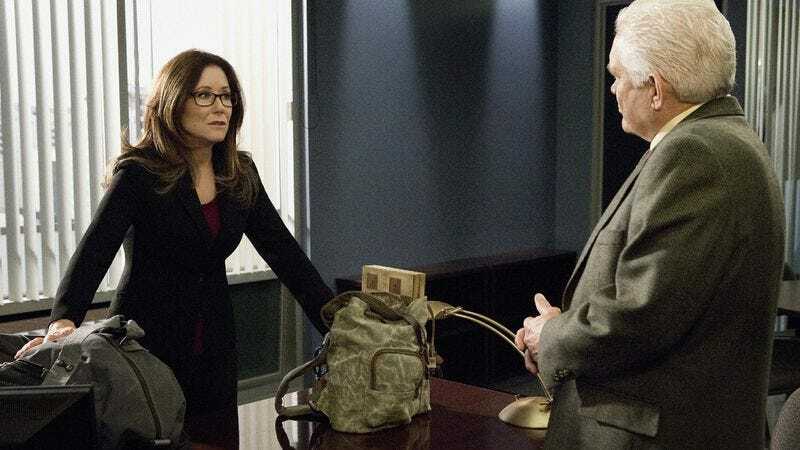 Rather than removing new lead—Mary McDonnell’s prickly Sharon Raydor—to a new situation, where she’s solving crimes as a small-town sheriff or something, the new series surrounds her with the characters from The Closer, as well as a couple of new characters. Sedgwick is gone, of course (it was her decision to end the parent series), and J.K. Simmons—often the best thing about The Closer—has also opted not to continue with the show. But the vast majority of the characters from The Closer are here, including Jon Tenney, who plays Brenda’s husband. (I’ll leave you Closer fans to watch the show’s finale and see how this all shakes out.) This makes Major Crimes that very rare thing in television: a genuine sequel series, where we follow a group of characters after the lead has left to do something else. There aren’t many examples of this, but you can probably think of Major Crimes as Mayberry R.F.D., that show that ran for several years after The Andy Griffith Show ended, just without Andy Griffith. This means that Major Crimes is basically The Closer, but with a new lead, but for one thing. Major Crimes has a genuinely fascinating and novel premise, one that could become significantly different from the other cop shows on the air, at least with time to develop. It’s rare to find anything new and timely in this hidebound genre, but the premise for Major Crimes is both. In the pilot, Raydor is promoted to the head of the Major Crimes unit that Brenda headed up for so many years (much to the chagrin of those who would have been Raydor’s superiors), and it’s revealed that her position has been created for one simple reason: The city of Los Angeles is broke, and it doesn’t have the time nor money to pursue death penalty cases (which must go to trial) through the legal system. If Raydor and the Major Crimes crew can build strong enough cases that suspects will cut deals to avoid the death penalty, then they’ll have saved everybody a lot of money. Thus, the story is less about catching the suspect and more about establishing how they did what they did. It may seem a subtle distinction from other cop shows, but it feels surprisingly fresh. But a novel premise isn’t enough. The series still has one of the major problems of The Closer: All of the personal conflicts are ridiculously heightened. To be sure, it’s a good thing when a show’s characters are pursuing different goals and have different points-of-view. This can make for good drama. But on both Major Crimes and the series that preceded it, the characters often seem to be upset with each other for no real reason. Yes, the show is constantly telling us the reasons for these conflicts, but this underlines the show’s approach to telling us everything that happens, rather than actually showing us what’s happening. There are numerous scenes in tonight’s episode where characters take out their frustrations with Raydor by telling her exactly what they think of her—in highly e-nun-ci-ate-d dialogue—and it all feels a little silly. Raydor’s not the easiest person to get along with, but it stretches credulity that every interaction with her would stop just sort of a cataclysmic fight. This is too bad. When the show is actually about the characters solving mysteries instead of squabbling, the crimes are intricately thought out and well-constructed. Yes, the show falls back on many of the same crime-solving tropes you’ll know well—one character says something that triggers another to look for a missed clue; the new, innocent hire knows more than she seems to—but the actual process of solving the crime builds well and feels like it goes somewhere interesting. Plus, McDonnell’s portrayal of Raydor is rarely exactly what you’d expect. She’s not often given a lot to work with, but she makes Raydor feel as if she’s gotten so used to pushing everyone in her life away that she rather relishes the moment when someone stomps up to her to stew about how awful she is, because that’s when the fun starts. This even extends to the series’ one genuinely awful idea, a homeless teenager (who also pops up in The Closer finale as a sort of symbolic passing of the torch) who ends up in Raydor’s care by the end of the pilot. Other actresses would use these scenes to show how Raydor’s fundamentally a good person—and they’re written that way—but McDonnell chooses to use them to show us how Raydor seems as amused by this situation as the audience must be, particularly in next week's episode, when the new situation has become the status quo. It’s almost as if she’s turning toward the camera constantly to say, “Seriously? They gave me a teenager?” McDonnell’s considerable talents aren’t quite enough to save the first two episodes, but her general approach to things signifies how the series is doing its damnedest to make a new version of The Closer that’s, nevertheless, fairly different from The Closer. Nobody’s going to mistake Major Crimes for anything new or different. The series does its best to remain mired in those character-centric cop shows of the past, rather than pushing for anything genuinely new. It doesn’t do nearly enough with its premise, which is the main thing that could distinguish it, and its overreliance on strained interpersonal drama as opposed to the kinds of more subtle conflicts that might actually exist between these people is often laughable. But the ensemble is tight—these people have been working together for years, and it shows—and the crimes are often intriguing. And if nothing else, that premise is the sort of thing that could truly set this show apart with time. Major Crimes will probably turn into just another cop show in time, but with McDonnell, its ensemble, and its premise, it has a fighting chance at becoming something special. Here’s hoping it keeps pushing for something new and isn’t just content to fall back onto what used to work. This is a mild spoiler for the pilot, but one that likely won't really spoil anything. At one point, the characters are trying to puzzle out how the gang communicates with each other, since they don't use the Internet or phones, so far as anyone can tell. They eventually conclude they're talking via a first-person shooter, but it sure seems as if everybody involved in the production of the show doesn't realize you need the Internet to play one of these games against other people in other locations. It's a very, very odd scene and just enhances the series' retrograde sensibilities.